SANTA ROSA, CALIF.—For people with disabilities, independence means more than just a celebration of the founding of the nation. It is a door being opened, a dropped house key being retrieved, a prosthesis brought to a veteran. These jobs and the independence they provide, is possible thanks to expertly trained Canine Companions for Independence® assistance dogs. Nearly 1 in 5 people in the U.S. have a disability. Many face physical barriers to meeting daily needs, such as turning on light switches and carrying groceries. Canine Companions for Independence transforms the lives children, adults and veterans with disabilities by providing trained assistance dogs to help with these types of tasks – as well as provide unconditional love and acceptance. Kiki is getting older and doesn’t have the energy to assist Adam anymore. She’s living the life of a spoiled pet, spending most of her days on our couch now, and Adam is on the waiting list to get a new assistance dog. Canine Companions has provided nearly 5,500 life-changing assistance dogs like Kiki — a $50,000 investment for the organization for the lifetime of each team — at entirely no cost to recipients. 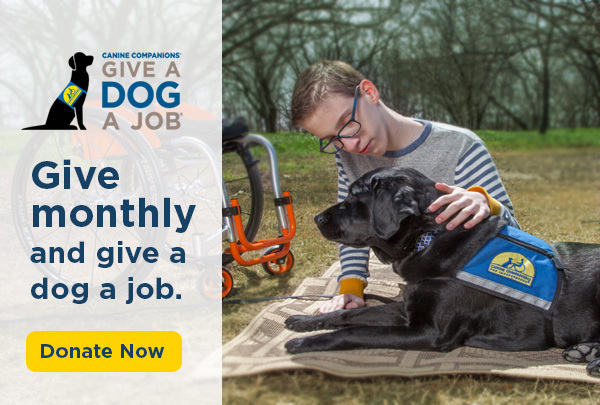 Canine Companions’ Give a Dog a Job campaign kicks off this week through Independence Day. 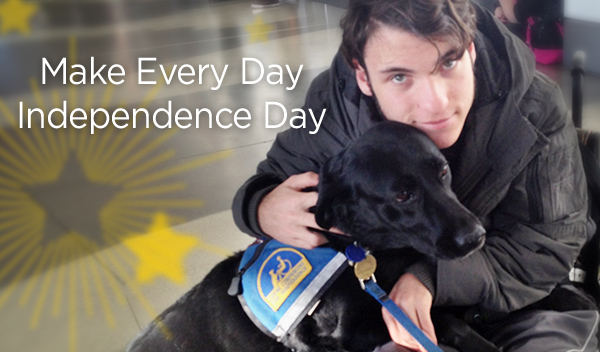 Learn how you can help Make Every Day Independence Day at cci.org/GiveADogAJob.